Here, you are looking at the DeatschWerks DW200 Fuel Pump. Once you start adding go-fast performance products that increase power, torque, and boost, then you have to start upgrading your fuel system to supplement the fuel flow needed for such modifications. My brother is a mechanic so he did most of the work, but the hardest part of the deal was finding out where the pump access cap was since my bro had not replaced one on a Subaru before. The entire pump replacement took 30mins thats including us trying to find the pump access. Came with everything we needed for a complete replacement! This is a must buy! It has restored my higher rpm power and smoothness, and increased my throttle response time! It was the difference between night and day after the replacement. There is a slight pump noise but only before I start the car, and I don't mind it at all, just pointing it out. Fuel pump was a nice upgrade to match my other upgrades. So far, so good. Install was straight forward and will need to remove backseat to make it easier to get to it. Used in my FXT and everything works great. No loud humming sound after install. All the parts came with the kit, which is nice. Only gripe is the pump unit is a little longer than the OEM one, so you have to bend the L shaped assembly frame downward a little to fit the fuel line on first, then bend it back up when the pump is mounted in. Not a big deal at all though. Owned this pump since 2015... and its still goin. I remember that we had to trim the rubber hose to make it fit properly. Also don't forget to prime the fuel line before trying to fire up the car. We did an on/off to prime it about 3x... install was fair. Seen reviews of this pump dying after a month... that's unfortunate, that's probably a QC problem at DW. I'm sure they've stepped up. I only got this pump as a replacement pump because my 04 STI was already 11 years old at the time. Doesn't hurt to maintain it in such a manner. I use these to replace my OEM pumps because they're about the same price and offer a support for future mods. The one in my Legacy has been in service for about 4 years now, and I just got one for my Forester. Some of the small hardware that comes with it is cheap, but the pump itself seems solid and I trust it more than a parts-store brand by a long shot. Only complaint is the rubber isolator may not fit perfectly on the new pump, may require trimming or moving the bracket slightly. Would I need a tune after installing or is this just install and go?! A: A tune would not be required, but a new tune will always maximize upgrades. It says on one description it has 200lph, but in specs it says 255lph which is it? Does this kit come with a filter pre-installed? A: The pump pre-filter is not installed on the pump, but it is included in the installation kit. 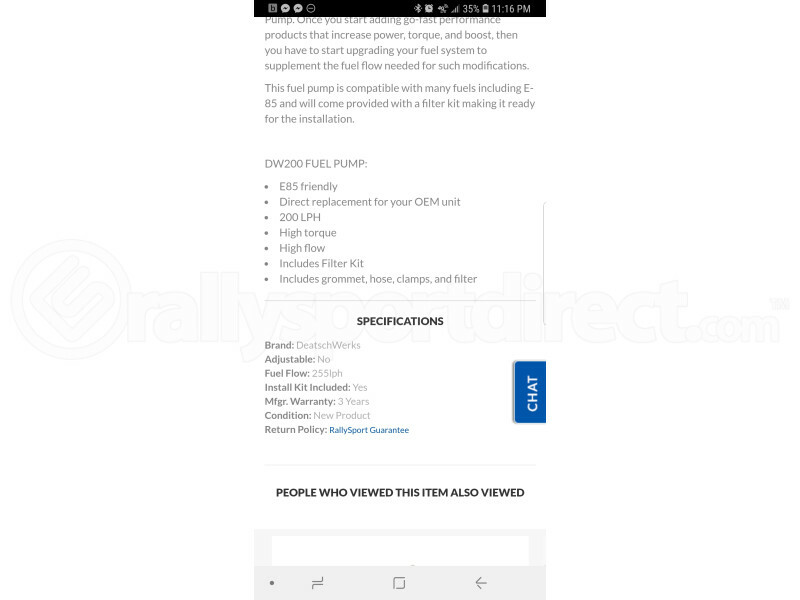 Will this work with Cobb tuning 1050x fuel injectors? A: This will work with the 1050x's, although you may want to go closer to a 255 LPH pump, depending on what fuel you are running. Just wondering if this will fit on my JDM 1996 version 4 STI? A: This kit should fit Impreza tanks from 1993-2007.